It is no exaggeration to say that the telephone has become an indispensable part of our daily lives. The speed of communicating by phone and the ability to reach the exact people with whom we want to speak have drastically changed the way business has been conducted over the past hundred years. Since World War II, many companies have turned to marketing in order to expand business. Marketing involves finding the most likely customers for a product or service and then targeting those customers for sales, investment, or other business activity. An increasingly popular form of marketing is telemarketing, or the use of phone calls to sell a product or service, to find out about potential customers, to stay in touch with current customers, or to provide consumers with the most current information on new products and services. Telemarketing allows callers direct contact with potential customers. The skills and education you need to become a telemarketer depend in part on the firm for which you plan to work. A high school diploma is usually required for any type of position, while some employers hire only people who have earned a college degree. Since you must be able to speak persuasively and listen to customers carefully, you will find classes in English, communications, speech, drama, and broadcasting particularly useful. Business and sales classes, as well as psychology and sociology, are also valuable. In addition, since many telemarketing positions require the use of computers for entering data, familiarity and experience with technology in general and data processing in particular are pluses. Although a college degree is not absolutely necessary for many telemarketing positions, some employers hire only college graduates. Since telemarketers communicate over the telephone, college degrees in English, speech, drama, and communication are especially useful for those aspiring to the job of telemarketer. In addition, general business classes, such as marketing, advertising, and sales, are valuable. Also, courses in psychology and human behavior can help telemarketers gain insight to the wide variety of people that they often speak to during the course of a typical workday. If a telemarketer’s phone calls focus on a complex product or service, as is the case with many business-to-business calls, people trained in the specific field involved may be hired and then instructed in telephone and sales techniques. Even though their work is done over the phone, telemarketers must be able to deal well with other people. This work requires the ability to sense how customers are reacting, to keep them interested in the sales pitch, to listen carefully to their responses and complaints, and to react tactfully to impatient and sometimes hostile people. You must be able to balance sensitivity to your company’s concerns with the needs of the customer. To succeed in telemarketing, you must have a warm, pleasant phone voice that conveys sincerity and confidence. You must be detail-oriented as well. While on the phone, you have to take orders, get other important information, and fill out complete sales records, all of which requires an accurate and alert mind. Many federal, state, and local laws have been enacted governing the sort of language and sales tactics that can be used with phone solicitation. Such legislation is intended to protect consumers from unscrupulous telemarketers operating phone scams. Telemarketers must be aware of these laws and conduct their phone sales in an honest and unambiguous manner. To bolster the industry’s image in the eyes of the public, several professional organizations exist to further the cause of ethical and effective telemarketing. Some states have guidelines or legislation to further regulate the activities of telemarketers. In California, for example, certain types of telemarketing agencies must register each year with the state, although most business- to-business telemarketing is exempt because sales are usually not the main goal of such calls. Telemarketers covered by the National Do Not Call Registry are required to access the registry every three months to obtain updates to the list, and then are required to remove those phone numbers from their call lists. There are many ways to gain practice and poise in telemarketing. Many organizations use volunteer phone workers during campaigns and fund drives. One of the most visible of these is public television stations, which conduct fund-raising drives several times a year and are always looking for volunteer help to staff the phone banks. Other groups that routinely need volunteer telemarketers include local political campaigns, theaters and other arts groups, churches, schools, and nonprofit social organizations, such as crisis centers and inner-city recreation programs. Approximately 400,000 people work part time or full time as telemarketers. Work is available at a wide variety of establishments, from large multinational corporations, educational publishers, and government agencies to nonprofit organizations, retail catalog outlets, and service businesses. While jobs in telemarketing can be found nationwide, the cost of operating call centers varies, depending on their location. Some of the most expensive cities in which to operate call centers, for example, are San Francisco, Washington, D.C., and New York, while the least expensive cities include Columbia, South Carolina, and Mobile, Alabama. Large corporations often house their telemarketing centers in cities where both operating costs and salaries are low. Agencies that hire telemarketers usually advertise for new employees in the classified section of newspapers, as well as on the Web. Another possible source of job leads is temporary employment agencies, many of which specialize in placing telemarketers with firms. It is important to note that employers of telemarketers sometimes interview job applicants over the phone, judging a person’s telephone voice, personality, demeanor, and assertiveness. Being prepared for such an interview before contacting an agency can make the difference between getting the job and having to continue to look. Employees undergo a great deal of on-the-job training after they have been hired. Trainers instruct novice telemarketers on the use of equipment, characteristics of the product or service they will be selling, and proper sales techniques and listening skills. They rehearse with the trainees using the script that has been prepared and guide them through some practice calls. 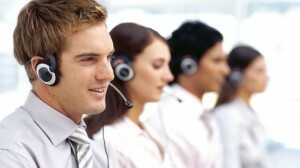 Within telemarketing agencies, employees can advance to jobs as telemarketing managers. These professionals have a variety of responsibilities, including preparing reports, writing telephone scripts, setting goals and objectives, implementing new service programs, monitoring and analyzing inquiries and complaints, recruiting, scheduling, and training. Along with these responsibilities, telemarketing managers sometimes enjoy rapidly increasing salaries because they can often earn commissions on the net sales achieved by the agency. Some telemarketers move into telephone-sales training, either with agencies or as independent consultants. Experienced telemarketers can sometimes find new jobs with higher paying firms, while others start their own telemarketing agencies. Telemarketers’ earnings vary with the type of work they do. The pay can range from the minimum wage ($5.15) to more than $18 per hour. Pay may be higher for those who deliver more elaborate sales presentations, work weekends, or make business-to-business calls. As telemarketers gain experience and skills, their pay scales rise. The median hourly wage for telemarketers was $9.79 in 2005, according to the Bureau of Labor Statistics. Median annual earnings were $20,360, and salaries ranged from less than $14,260 to more than $36,680. Telemarketing workers also frequently enjoy such employee benefits as health and life insurance, paid vacation and sick days, and profit sharing. With such a wide range of organizations for which telemarketers can work, the benefits offered depend entirely on the employer. The offices in which telemarketers work can range from the very basic, with standard phones and desks, to the highly advanced, with computer terminals, the latest in phone technology, and machines that automatically dial numbers from a database. There may be just four or five telemarketers in a smaller office or more than 100 working at a larger office. While the work is not strenuous, it can be very repetitive. The amount of supervision depends on the employer and the region of the country. California and a few other states, for example, have laws that prohibit recording calls or monitoring by supervisors unless both the telemarketer and the person being called are aware of it. Telemarketing requires many hours of sitting and talking on the phone. Customer rejections, which range from polite to rude, can cause a great deal of stress. As a result, many telemarketers work only four- or five-hour shifts. Telemarketing is an ideal job for people looking for part-time work because workweeks generally run from 24 to 30 hours. Because many agencies need staff at unusual hours, telemarketers are often able to find positions offering schedules that match their lifestyles. Many agencies require staffing 24 hours a day to handle such calls as airline reservations and reports of stolen credit cards. Telemarketers who make business-to-business calls work during normal business hours, while those who call consumers make most of their calls in the evening and on weekends, when more people are at home. The Bureau of Labor Statistics expects telemarketer employment to decline through 2014. Causes for this decline may include the movement of call-center jobs overseas and the implementation of the National Do Not Call Registry. The National Do Not Call Registry, a free service offered by the Federal Trade Commission since June 2003, allows consumers to add their phone number to a do-not-call list, from which telemarketers may not call. The registry’s effect on the telemarketing industry has not yet been measured, but some employers are attributing decreased call volume and sales to the registry, as well as call-center shutdowns and layoffs. The Direct Marketing Association reports that telemarketing companies’ call lists have been hard hit by the registry, with 25 to 50 percent of companies’ call lists wiped out as a result. Ultimately, rapid growth combined with high turnover among workers will result in many opportunities for new people entering the telemarketing field.